Elton Britt article courtesy of W. K. McNeil and Louis Hatchett. 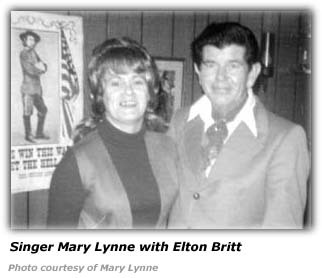 For someone who had a such long career as a country music artist, not much accurate information is really known about Elton Britt. This is by his own choice. He was a very private person offstage, and was never comfortable with the idea of stardom. Once he stepped offstage, his charisma vanished, and he reverted to that of a quite normal human being. As someone who got to know him once said, "He could have been a bus driver." Elton Britt was born June 27, 1913, the youngest child of James M. and Martella Baker, in Zack, a tiny community nine miles from Marshall, Arkansas. A sickly child, he wasn't expected to live; as a result, he wasn't named until he was over a year old. His parents eventually named him James, after his father, and Elton, in honor of Dr. Elton Wilson who managed to keep him alive during his first year of life. Elton was what is now known as a "blue baby" and was plagued with heart trouble all his life. Because of his condition, he was pampered by his parents, who may or may not have given him the nickname "Cute," by which he was generally known during his early years. The Bakers were a musical family, so it is hardly surprising that young Elton also acquired a love of music. He first started playing guitar at age ten with a $4.95 instrument purchased through the mail from Montgomery Ward. Later he was greatly impressed by the records of Jimmie Rodgers, which inspired him to learn how to yodel. Eventually, he became renowned for his ability to sustain his yodel for an unusually long time. This skill, enabled by the perfection of breath control, he reportedly learned while swimming underwater for several minutes at a time. Elton's chance for stardom came in the summer of 1930 when he was hired to replace young Hugh Ashley (who had performed under the name of Hobart Walton) in the Beverly Hill Billies, a popular group who broadcast almost daily from KMPC. What was intended as a six-week stay in Los Angeles turned out to be the first step in a career that lasted for 42 years. It was during his stay with the Hill Billies that Elton acquired the name Britt, a surname which sprang from the mind of Glen Rice, an employee with the McMillan Oil Company, which owned KMPC, after he concluded that James Baker didn't sound hillbilly enough. During his tenure with the band he also entered into the first of his four marriages. His first wife, Margaret Scott, whom he wed in February 1934, was a fifteen-year-old relative of his brother Vernon's wife. A year later, in September 1934, Margaret was killed in an automobile accident in Cleveland, Oklahoma. In 1935 Britt married Jeannie Russell, a Canadian citizen, who died two days after the birth of their second child on June 9, 1937. His third wife, Penny, was a long-time Britt fan whom he wed in 1942. Their marriage lasted almost sixteen years. In 1958 he wed Janet Counts, a woman twenty-five years his junior. Their marriage was dissolved a couple of years before Britt's death. Elton had children by each wife, except the first, but none followed him into the world of music. During the first half of the 1930s the Beverly Hill Billies made a number of 78s and Britt may have been on some of them, but it is impossible to determine on which ones he appeared. His first documented recordings were in August 1933 for the Conqueror label as part of a group called the Wenatchee Mountaineers. In June 1934 Britt's first significant recording, and what became a signature song, "Chime Bells," was made with his brother, Vernon. He released versions of this number a second time in 1939 and in 1948, the latter making its way onto the Billboard charts. In 1937 Britt signed with RCA Victor, a label on which he remained until 1956. 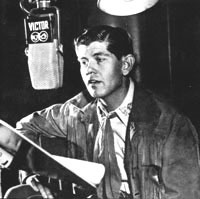 During this time he had several hit records, including "Someday" (1944) "Detour" (1946) "Candy Kisses" (1949) and "Quicksilver" (1950). But without question, his biggest hit was "There's a Star Spangled Banner Waving Somewhere" (1942). Estimates of its sales range from just over a million to four million. Possibly both figures are correct with the former number reflecting sales during the record's initial period of popularity and the latter number likely reflecting total sales over the many years it remained in the catalog. Aside from his recordings, Britt had an interesting career. He appeared in at least two movies--and maybe three. His first screen appearance was a cameo in the James Melton western short The Last Dogie (1933), which was released while he was still with the Beverly Hill Billies; it did not, however, do anything to advance his career. Neither did a featured appearance years later in Columbia's Laramie (1949), a Charles Starrett western. Britt may have appeared in The Prodigal Son (1949) for Universal but no evidence has surfaced to indicate it was ever made. During the 1950s Britt made a habit of retiring and unretiring. During one of his frequent breaks from show business, he mined uranium in the West. In 1960 he retired once again, this time to wage an unsuccessful campaign for President of the United States on the Democratic ticket, an effort that was widely seen as a publicity stunt masterminded by Aubrey Mayhew, his sometimes manager. He then returned to entertaining and in 1968 had his last major hit with a seven-minute yodeling song, "The Jimmie Rodgers Blues." On June 22, 1972 Britt suffered a heart attack while driving his car and died in a McConnellsburg, Pennsylvania hospital the next day. He was buried in the Odd Fellows Cemetery in Broad Top, Pennsylvania. A monument listing many of his hit songs was later erected over his grave. We've discovered in our web surfing that through the efforts of The Elton Britt Fan Club, the Native NY Historical Society has made his residence, 6-03 Parsons Boulevard, the only official Landmark House in Malba, New York. Hillbilly-Music.com wishes to thank W. K. McNeil and Louis Hatchett for providing the biographical notes on Elton Britt.